We need to talk about the problem in education. You may have heard some scary things about today’s colleges. For example, you may have heard how all millennials (like me!) want for Christmas is… one student loan payment. Or how more people than ever are defaulting on student loans, and it could put our entire economy at risk. Yikes! Or maybe you’ve heard the traditional line, “Don’t study English if you want a job.” I know, I know – it’s usually delivered as a joke. But it’s not always that funny, especially to someone like me who’s thinking about my future. You might think that the only jobs English degrees are good for are teaching jobs. And you wouldn’t be wrong for thinking that. In fact, most English professors – whether they realize it or not – teach their students how to follow their paths. These things aren’t really my professors’ faults, though. As you know, the world has changed since you were a kid. Even just a few decades ago, you could go to school, graduate, and find a decent paying job with minimal debt. But in the last 20 years or so, since you’ve been raising me, the job market has changed forever. This change meant professors had to focus completely on being a professor if they wanted the few jobs that were available. The result? My professors have only ever been professors, and they – through no fault of their own – simply aren’t familiar with what it takes to get a non-teaching job today. It’s alright. I forgive them. But that doesn’t mean you and I can’t be worried about my future and how I’m going to pay for all this school. 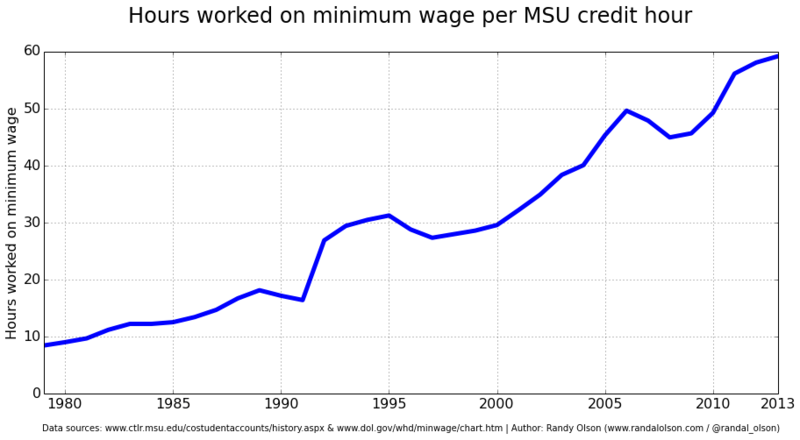 Did you know it’s now mathematically impossible to pay your way through college with a minimum wage job? So as much as I’d like my campus job to cover all my tuition expenses… it simply can’t. That means I’m probably going to be stuck with student debt. The average graduate for 2017 will have more than $37,000 in debt. When you combine that with the traditionally low-incomes for English majors, it’s unlikely many of us will ever get completely paid off. All these things scare me, and I’m sure they concern you, too. But there’s something I think can help. I came across this course I think could help give me the future you always wanted for me. In fact, I think it could help me solve many of the problems I’ve just described. 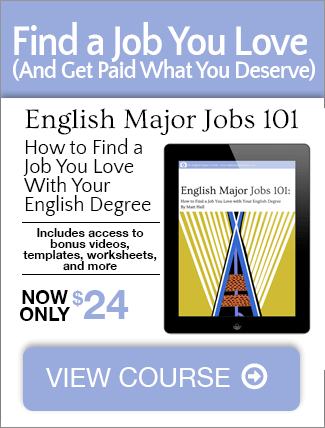 This course’s called English Major Jobs 101: How to Get a Job You Love with Your English Degree. It’s written by an English major who currently makes a high salary and healthy side income through freelancing. 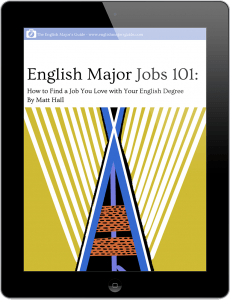 The author, Matt Hall, learned through personal experience, interviews, and research about how English majors can get jobs. Then he spent years writing this course based on current job market trends. I studied English because I wanted to lean into my strength as a writer for my career. Four years later I was a better writer, but had no idea how to make a career out of it. Eventually, I found an unpaid internship which turned into a low paying job where I now supervise interns who face the same problem. No one had answered the question, how do I turn my writing skills into a career? Matt Hall answers the question. Not only have I begun to branch into lucrative freelance work myself, I recommend the book to every undergrad intern who comes through our doors. English Major Jobs 101 provided practical advice and real-world examples that are applicable, even after graduation. The suggestions provided encouraging direction without being overbearing. It helped me to recognize different areas where my degree is valuable and applicable for not only finding a job, but finding a better job. Plus, the activities felt thought-provoking and didn’t feel like busywork. Thanks for creating all these resources for English majors. I worked through a lot of the course’s steps before graduating in May and ended up landing a job as a content writer for a national non-profit. Sounds pretty good so far. But I want to tell you about what’s inside the course – not just what other people like me say about it. Most importantly, the things I learn in the course will benefit me throughout my career. These principles work for any job. They’ll give me confidence to do great work that’s creatively satisfying but also makes sure the bills are paid. I’m sure you might have been nervous when I said I was studying English (even if you tried to hide your nervousness from me). This course can help change everything and make English one of the most desirable degrees I can have. Anyway, I know Christmas just passed. (Thanks for the great gifts, by the way – you’re the best!) Can I ask just one more favor? Can you get me, your child, access to this course so I can get a good job someday? Once you’ve purchased this through a secure payment connection, I’ll get an email with log in information and be able to immediately start learning! I’ll want to start early, too, because early career earnings can translate to an extra $1.4 million over the course of my career – or more. Thanks, parent(s). I promise when I’m in a comfy job with benefits, I’ll treat you to a nice vacation someday. You’ll deserve it for all that stuff I did as a teenager. PS: I definitely want to read this before I start the semester so I can get extra advantages right away. Can you get this for me today? PPS: Through the things he shares in the course, the instructor was able to support his family of four in Silicon Valley on a single income! That’s one of the most expensive places in the world, and this proves English majors can be great degrees if you know how to use them. PPPS: Here’s that form you can fill out, and I’ll get instant access to English Major Jobs 101. But if you want to learn more, you can still click here. Fill out the secure payment form below to create your account and get instant access. Cancel hassle-free anytime.